After completing a degree in History of Art at Manchester University, Jane spent her early career with a London firm of Fine Art Valuers and Consultants travelling and living abroad before returning to London to set up and run a recruitment company, which she then sold after a decade. On moving to Dorset in 2013, she has revived her love for sculpture inspired by her life long interest in wildlife, and the outdoors. 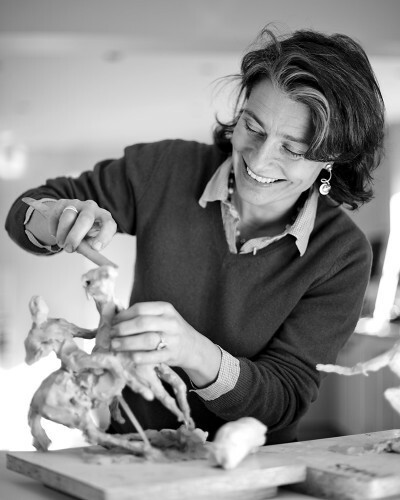 Jane is passionate about capturing the overall essence and movement of animals and wildlife in her bronze sculptures. Her focus is to portray the power and character of each individual animal by using fluid, spontaneous and strong gestural strokes in any material she uses. Often working directly from life, she produces bronzes for both inside the home as well as garden pieces on a larger scale. In both 2015 and 2016 she was awarded First Prize for her sculptures of a Racing Greyhound and a Head of a Hare, at the Bath & West Show. Alongside her own sculpting career, Jane became involved with a local art project, specifically designed for individuals who feel isolated from their community through mental illness, or disability. Jane used art to build their confidence and feeling of self worth. Jane continues with her own sculpture projects mainly focusing on wildlife and animals, producing work mainly in bronze and is now beginning to develop larger scale projects in plaster which are then cast in bronze or resin for the outdoors. She is about to embark on a commission of larger than life lying sheep which will be used as a garden seat!